Last Thursday & Friday was the bi-annual SEO Pilgrimage to the wonderful seaside town of Brighton and we went down for some training and to soak up all the best talks in the industry. So, what was the key takeaway that we learnt. The internet is broken. We are not making websites for users. Site speed was the theme of our training & many of the talks that we went to. We want to make the internet a better place for our clients & not contribute to the slowing down of the web. Did you know that best practice for loading time on a website is 3 seconds? Did you know that no industry is hitting that benchmark! 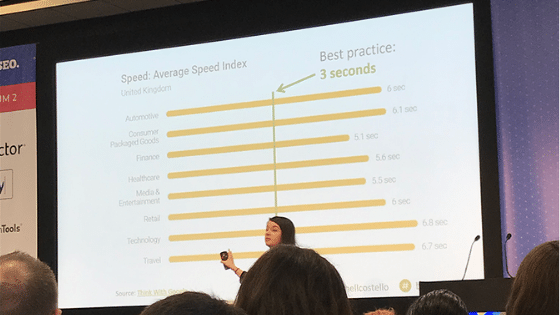 Technology industry sites have the slowest average site speed at 6.8 seconds! This almost seems ironic! But how do we give the user the perception of speed – if our site is slow? A huge theme across a majority of talks & our training was PRIORITISE THE ABOVE THE FOLD content! That is everything that will appear on your user’s screen before the scroll down. Make sure that content loads & is usable before they have to scroll down and then lazy load the rest of the page. Great you say but my website is still slow. Images. Check your images. Are they fully optimised & compressed? Where are they being hosted? How many requests are being sent for your multitude of images? Are images being loaded according to user device? These are all questions you need to be asking your Dev team. We need to unite with the developers and start having conversations on how to improve speed & just user journeys on sites. SEO & Developers are no longer siloed, we need to be one happy family that works together! We need each other to make the internet a better place for users! Another huge thing that came through was LINKING! Backlinks are always a huge topic of conversation at BrightonSEO, but Christoph Cemper spoke about improving rankings using Internal Links. You probably at this point are very confused, as, how does that make your brand more credible. Internal links are often very overlooked. External links bring the power and the trust to your site, but internal linking keeps your users on your site! We need to change our mindset & action! Simple changes of changing brand phrases (product names etc) into ‘money phrases’ is giving more purpose and more of a call-to-action to links, therefore prompting users to click on them and move through your site. Don’t always follow the crowd, what may work for your competitors, may not work for you. So, remember to always TEST! Another massive topic that had everyone talking was Google E-A-T! Yes, those updates that started in August 2018 and saw everyone’s traffic decrease dramatically. These updates have been causing pain in every SEOs life, but Lily Ray gave an insightful talk on how to leverage E-A-T for SEO Success. Make sure any YMYL (Your Money, Your Life) content is supported by scientific or accredited evidence. Ensuring your website provides an authentic journey & does not spam the user, Google will rank your site higher! 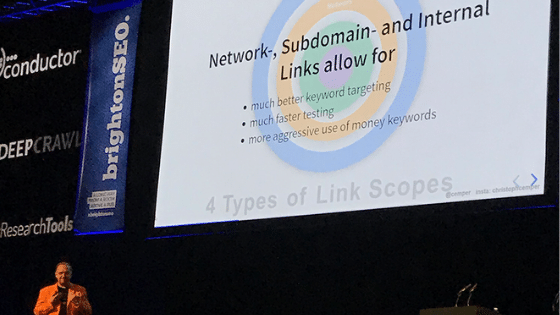 These are our top takeaways from BrightonSEO and we will be working incredibly hard to implement our learnings in a bid to make the internet a better place for all users! Want to know more about any of these topics? Give our experts a call and we can see how these will help your business grow in 2019!